Ladyslipper Constantine is a resident who's been involved in a number of activities in Second Life. She was at the recent "One Billion Rising" demonstration in Second Life for women's rights worldwide. But she's best known for her work with Burn2 as a member of DRUM, as well as one of the rangers, and has also been involved with the Second Life Birthday, and Virtual Ability. Recently I had a chance to chat with her, and we met at a skybox. Ladyslipper Constantine: "A real-life friend of mine told me about it, I joined, got totally lost so (I) quit. Same friend talked me into coming back about six months later, but I couldn't remember the first avi's password (grin). The second time the friend was around to help." Bixyl Shuftan: "So the Second time went better?" Ladyslipper Constantine: "Much better! There was actually an orientation area that explained a few things." Bixyl Shuftan: "Sounds good. How long did your beginning period in Second Life last?" Ladyslipper Constantine: "With the first avi? About three days (laughter). I could not figure out what I was doing, and I didn't know anyone and no one talked to me. It was just these tall buildings, some men standing around and I just had no idea what I was supposed to be doing. So I emailed my friend and said 'forget it' (laughter)." Bixyl Shuftan: "Heh, and your beginning period the second time around?" Ladyslipper Constantine: "I'm still her (smile). My friend took me under her wing, showed me where to get things to look better, showed me where she lived and allowed me to set a home base there until I could explore SL more. And best of all she introduced me to others who were inworld more than she was able to be." Bixyl Shuftan: "Sounds like things went very well." Ladyslipper Constantine: "Yes, they have. And my experience as a noob, is why I became a mentor." Bixyl Shuftan: "When did that begin?" Ladyslipper Constantine: "After I had been in SL for about six months to a year I think. I can't remember for sure." 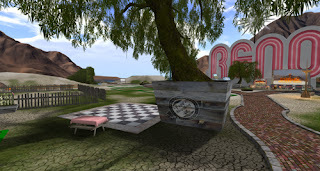 Bixyl Shuftan: "When did you first hear about Burning Life/Burn2?" Ladyslipper Constantine: "I heard about Burning Life via some friends, and to be honest, my first visit there was terrible. I didn't have a good computer and the lag was so bad I couldn't move. But the next year was better and then I decided to volunteer as a Ranger. I've been one every since and am also an Estate Manager for the sim." Bixyl Shuftan: "How long have you had that post?" Ladyslipper Constantine: "I've been a Ranger ever since that first year and I guess it was when they made me a ranger ops lead that I became a Estate Manager. I think my 2nd yr as a Ranger. I'm not a Ranger Ops lead any more tho, just a Ranger, but still an EM." Bixyl Shuftan: "I take it that can be a busy job at times"
Ladyslipper Constantine: "Yes, during the October big burn, less so during the smaller events." Bixyl Shuftan: "How did you join up with the Drum group?" Ladyslipper Constantine: "I met one of the drummers and he invited me to try out as they were looking for more. All the drummers in that first group except one, are no longer with DRUM. Brigitte Kungler who is actually the founder, is still with us, and she's also our director as well as she made most of the sounds for our drums. And BTW, DRUM stands for 'Divine Rhythms of Universal Music.' "
Bixyl Shuftan: "Where did that name come from?" Ladyslipper Constantine: "It's universal because our sets are from various cultures around the world, as well as some that are just us (smile), like the Rusty Barrels set. To quote what we give out in info cards: 'We have a variety of different sets we play live, including Taiko, Native American, African, Latin, East Indian, Mallet, Wall set, Steel Pan, African Ghost, Rack, Rusty barrels, and our newest set, Brazillian.' And we can usually do 5 of those sets in an hour performance." Bixyl Shuftan: "Sounds good. Have any of your performances over the years stood out?" Ladyslipper Constantine: "I guess the ones at the Second Life Birthdays do, but we've enjoyed doing them all over (smile). 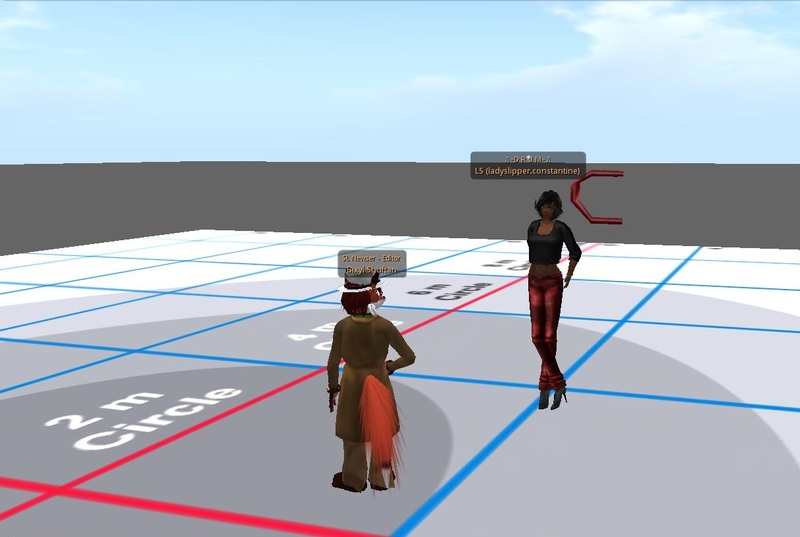 The largest crowd we had was at the end of a Virtual Ability event, 62 avatars were there." Bixyl Shuftan: "That's quite a crowd." Ladyslipper Constantine: "Yes! We play for a lot of non profits, and our next one is this Sat (Feb 13) at Noon if you've never seen us play. It's at Creations (for Parkinson's) sim." At a few points I had snapped some pictures, and it was about then I had taken one of some objects to the side. She asked, "Did you just take a picture of me?" I responded, "Oh, I took one of you earlier, but the last one was of the items over there," and pointed them out. She responded, "Ahh, our subscribo." Of the directional letters around the skybox, "And those letters are because I'm directionally challenged, and so when I go to the location to see which direction we'll be facing, I come back here to rez the drums properly. That way they are usually good when I rez them at the venue. although I have been known to mess up at times. (grin)"
Bixyl Shuftan: "What kind of messes? (grin)"
Ladyslipper Constantine: "Like not have the set facing the way it should face when first rezzed, and then forgetting to link it all to rotate it. But it's rare that happens now, thank goodness (laughter)." Bixyl Shuftan chuckles a bit: "With that in mind, were there ever any bloopers that were especially memorable?" Ladyslipper Constantine: "Yes, main one for me was not linking the six little tin cans on our wall set, and then not just linking those 6 together to take, but doing it one by one, and then I had to come here to rezz the whole thing and hope I had them all back in the right place. Those cans are what the drummers click on to get in position and have that drum's animation inside." "I need to add this too about DRUM. 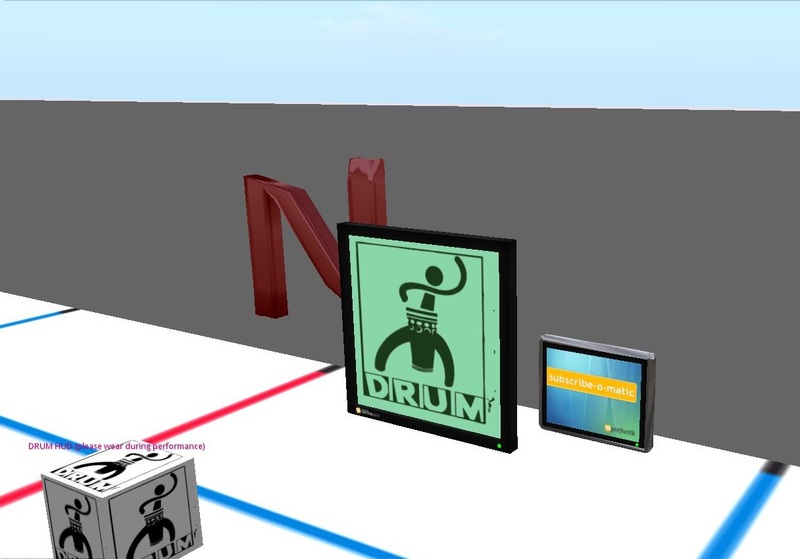 All the sets, the sounds and the animations were all made by either past or present members of DRUM." Bixyl Shuftan: "Does DRUM appear at every single Burn2 event?" Ladyslipper Constantine: "No, not every single Burn2 event. Just usually the (main) October one, although we have played at a couple others." Bixyl Shuftan: "I imagine you're seen many changes in Burning Life/Burn2 over time." Ladyslipper Constantine: "Oh yes. Burning Life was huge because Linden Lab supported it. Burn2 arose when LL quit supporting it as we couldn't use the name Burning Life (any more). Now it we have to rely on donations to get the sims. That and the money folks spend to get a plot to build on at the Oct. event." Ladyslipper Constantine: "That's asking a lot of me to just pick one or two as there have been so many outstanding ones. I really can't just pick a few. Some of the temple builds have been totally awesome. Dama ( I can't remember his full SL name) built some very good ones." Bixyl Shuftan: "So was there anything you can tell us about this year's Burn2, or the spinoff events such as the Burnal Equinox?" Ladyslipper Constantine: "Burnal Equinox will take place, give me a sec to find the date again ... will take place April 2 and 3, 2016 and the theme is 'Picnic on the Playa.' Fairly soon on the burn2.org website, information about getting a free plot should be available. After Burnal Equinox, we ususally have another small event before the big week long October event. That event is called Conception and is usually longer than just two days. There are volunteer opportunities as well, and those are listed on the website www.burn2.org. Not for Rangers though as the training for Rangers doesn't take place until about the month before the October event." Bixyl Shuftan: "What can you tell the readers about that?" Ladyslipper Constantine: "You mean about being a Ranger, or about any volunteer opportunity? For (volunteering), we can always use stage hosts and greeters, greeters not for the stage, but for the landing area. Stage hosts would greet at the stage, but they also usually have to know how to set a stream for the performer." "A Ranger helps check builds for compliance before the event, and during the event we moderate disputes so everyone is happy. We also walk the playa checking things out and making sure all is well. We definitely aren't cops. (grin) We can eject from a sim, but most Rangers don't have the ability to ban. Only an Estate Manager can ban and that's done only if the person causing a problem refuses to stop." "It is fun to be a Ranger, and takes patience at times. You get to meet a lot of nice folks rangering. We do not order folks around or come across as bossy just because we wear the Ranger hat. So anyone who thinks it's like that, would not be a good candidate for a Ranger." "And that's about it that I can think of for volunteering at Burn2. Ohhh, I did forget one thing. there are classes being offered now for building art cars and also basic scripting." Bixyl Shuftan: "The mutant vehicles?" Ladyslipper Constantine: "Mutant or art (smile). I think the guys prefer to call them art cars now. They provide the scripts for the cars as well as the basic build, but then the student does what they want to that build and some turn out some amazing vehicles. Many of them are put into a vendor for folks to ride around in during an event there." Bixyl Shuftan: "What in your opinion have been some of the more outlandish designs?" Ladyslipper Constantine: "Hmm, another tricky question. Funny ones were like the toilet, huge ones were like the one where everyone on it was dancing. And then there are the cute ones, like I bet you will see at Burnal Equinox, because of the theme, picnic food cars maybe." Bixyl Shuftan: "Heh, so a case of 'eating on the run?'" Ladyslipper Constantine: "(laughter) Maybe. DMom built a cute one yrs ago, that had you drumming while you rode. ... People come up with the most creative ideas. That is what I enjoy so much about Second Life, the creativeness. Oh and one more thing about the upcoming Burnal Equinox event, something will be burned, but I'm not going to tell what that will be. (grin) It won't be the Man as we can only burn him during the October event." Ladyslipper Constantine: "Right! Like at one event earlier, we burned a Phoenix. At Santalarity we burned a tiny village. (smile)"
Bixyl Shuftan: "(grins) I take it no Tinies were harmed in the event?" Ladyslipper Constantine: "Nope, and I'm proof as I was a tiny during that one. Hee-hee." Bixyl Shuftan: "Heh. ... Well, it's been a while since we started. Did you have anything else to add? Ladyslipper Constantine: "I can't think of anything. ... Thank you Bixyl." We would chat for a few more minutes before it was time for us to go our separate ways. I would later see Ladyslipper again at "One Billion Rising." No doubt she'll continue to be active in Second Life for some time.